Passed away peacefully on Tuesday, September 25, 2018 at her home surrounded by her family. She was 74 years old. 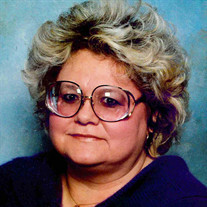 Barbara Jo Twarozynski was born on May 21, 1944 in Saginaw, MI to the late Anthony and Lucille (Bosserdet) Twarozynski. She married Daniel A. Metiva, Sr. at St. Anthony of Padua Catholic Church in Saginaw on July 28, 1962. He preceded her in death on July 2, 2000. Barb was a faithful member of Holy Spirit Catholic Church. She is survived by her three sons and their spouses: Dan Jr., Mike and Chris; grandchildren: Danny III, Justin, Casey, Hunter, Garhet and Princess Hailee; and one great-grandson, Daniel IV expected in December; ten brothers and sisters, their spouses; brother-in-law and sister-in-law. Barb is also survived by many nieces, nephews, extended family and friends. Barbara was preceded in death by her parents; and in-laws: Norman and Leona Metiva; her sister and two sisters-in-law. FUNERAL: A funeral liturgy for Barb will be held 10:00 a.m. Saturday, September 29, 2018 at Holy Spirit Catholic Church, 1035 N. River Road, Saginaw. Burial will follow at St. Andrew Cemetery.